For the upcoming Angry Birds Go mobile kart-racing game, Hasbro has launched two new action game lines, Angry Birds Go Telepods and Angry Birds Go Jenga. 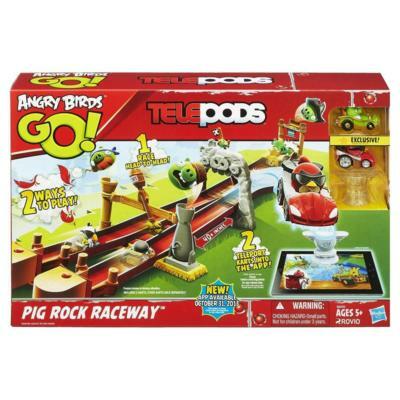 Angry Birds Go Telepods is, like its namesake, a game of kart racing. In addition to use for tabletop (or floor) play, though, the karts can interface with a device for integration in the mobile game. 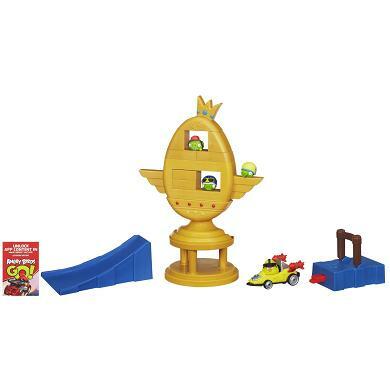 The Angry Birds Go Telepods Pig Rock Raceway set ($30 SRP) includes two karts, launchers, and a course with dynamite and pig obstacles. Race to knock the pirate pig off the treasure chest. 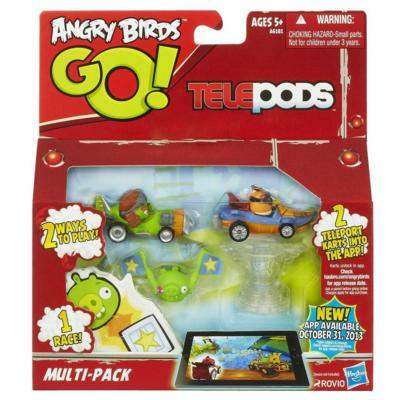 The Angry Birds Go Telepods Multi-Pack adds two karts and two targets for $10. 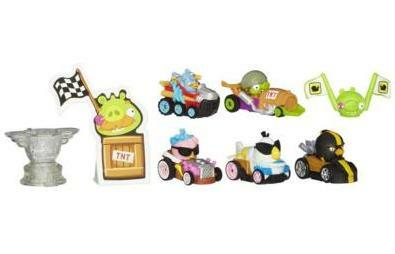 The Angry Birds Go Telepods Deluxe Multi-Pack features five more karts and two targets for $20. 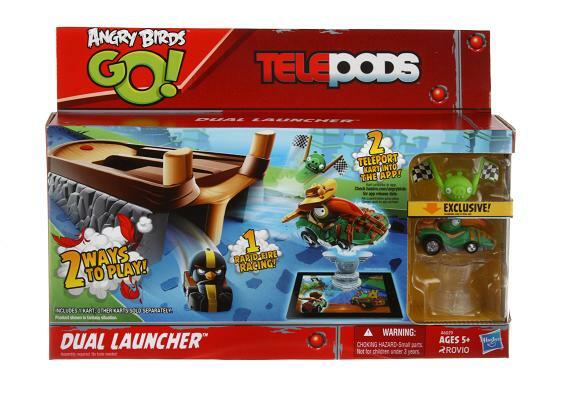 At $15, the Angry Birds Go Telepods Dual Launcher set includes another kart, a two-position slingshot launcher, and a pig target. Karts will also be sold in single-packs for $5. With the Angry Birds Go Jenga game, play is about zipping karts off ramps and knocking things down. 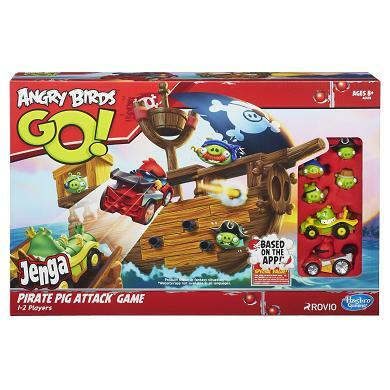 Among the sets available is the Angry Birds Go Jenga Pirate Pig Attack Game ($30) with two karts, five pigs, two launchers, a ramp, and a large pirate ship as the target. In the Angry Birds Go Jenga Trophy Cup Challenge Game ($20) the target is an oversized trophy (also comes with one kart, three pigs, a launcher, and a ramp). 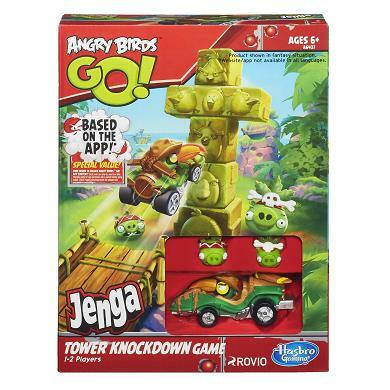 There’s also an Angry Birds Go Jenga Tower Knockdown Game, which (surprise) comes with a tower to knock down (plus one kart, two pigs, a launcher, and a ramp) for $15.